This photo, just in from our colleagues in Brussels, was taken earlier this week when demonstrators took to the streets around the gated community of Square du Bois (locally known as Miljonairssquare - Millionaires Square). 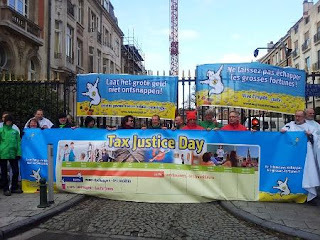 The protest targeted rampant tax evasion, special tax treatments and unnecessary exemptions given to Mega-Rich people who pay no or virtually no tax, hence their Tax Freedom Day comes right at the start of the year while ordinary people end up paying close to half their total income in direct or indirect taxes and don't reach their Tax Freedom Day until approximately mid-year. The concept of Tax Freedom Day goes way back to the late 1940s when anti-government groups in the United States started to calculate the first day in the calendar year when the federal government had received sufficient income from tax revenue to fund its budget. Every cent of official income is included, and every payment to the state - at federal, state or local levels - that is officially considered a tax is included. Much has changed since the 1940s, but from a tax justice perspective the most important changes across the world include the regressive trend towards indirect taxation, the huge increase in the use of offshore facilities to evade and avoid tax, and the general increase in exemptions aimed at subsidising rich people, which has led to the outrageous situation in which the poorest people in many countries (Britain for example) pay more tax as a proportion of household income than the richest people pay. This is the point that the protesters in Brussels are seeking to highlight.